Considering your options for getting your luggage to Uni in London? If you are going to university in London, you will have a lot to think about before you move there. You will need to sort out accommodation, buy everything you need for your course, work out how to get to London and how to transport your possessions to your halls of residence. Send My Bag has put together some information on several London universities that will help you find out more about them, give you directions on how to travel there and offer advice on sending your luggage to university. Imperial College London has grown out of several mergers between institutions. The university is made up of four faculties: science, engineering, medicine and business. It is a world-class institution, ranked as the 2nd in the world in the QS World University Rankings 2014/15. Their members include many distinguished figures, including 14 Nobel laureates. With over 7400 international students (2013/14) from more than 125 countries, the university is a truly international community. Heathrow and Gatwick are among the busiest airports in the world, offering many international routes. London City offers convenient travel from various regions in the UK and transports you close to the heart of London. London is also served by the Eurostar, arriving at St Pancras International. There are numerous rail and bus networks serving the airports. Heathrow and London City airport are served by the London Underground (The Tube). The Piccadilly line serves Heathrow and the Docklands Light Railway serves London City. Stansted, Gatwick and Luton are served by fast rail services into London. Taking a coach is another convenient option from all airports. The largest coach network is run by National Express. For travel within London City Centre, there is a vast bus and underground network. In order to travel on this network, it is advised that you obtain an Oyster card, which will provide cheaper travel than buying individual tickets. Oyster Cards can be topped up online or at ticket machines. These cards can then be swiped to open barriers into/ out of the Underground or on buses. The Oyster card, therefore, facilities speedier and more convenient travel. Cards can be obtained either at a station or online at the Transport for London website http://www.tfl.gov.uk/ . The main campus of Imperial College is in Kensington, and there are several additional campuses, including those in the Chelsea, Hammersmith and Paddington areas of London, as well as in Berkshire and Kent outside of London (and also in Singapore). There are public transport routes to all campuses. The main Kensington campus can be reached a short distance from the South Kensington Tube Station (Piccadilly, Circle and District lines). Why not send your bags to Imperial College and save yourself the hassle of dragging bags on public transport and avoiding altogether excess baggage charges at the airport. At Sendmybag we ship luggage around the world, allowing international students to send their bags to their university accommodation. We not only offer international student shipping but also shipping for domestic students across the UK. If you are sending your bags to student accommodation you must check what facilities are available for receiving your luggage. Note that Imperial College London halls of residence are unable to accept luggage sent ahead of your arrival, so make sure that your bags are due to arrive at a time when you are able to receive them in person. Founded in 1829 by King George IV and the Duke of Wellington, King’s College London is today ranked one of the top 20 universities in the world. It has many illustrious alumni, among them eight Nobel Prize winners, such as John Keats, Florence Nightingale and Desmond Tutu. It also counts over 7,600 international students (2013/14) among its student body. There are numerous rail and bus networks serving the airports. Heathrow and London City airport are served by the London Underground (The Tube). The Piccadilly line serves Heathrow and the Docklands Light Railway serves London City. Stansted, Gatwick and Luton are served by fast rail services into London. Taking a coach is another convenient option from all airports, with the largest coach network run by National Express. KCL has four campuses: Strand, Denmark Hill, Guy’s and Waterloo. Here are transport links to help you get to each KCL campus. The Strand campus can be reached by foot from several underground stations. These include Temple (District and Circle lines), Charing Cross (Bakerloo and Northern lines) and Embankment (District, Circle and Bakerloo lines. Several train stations are also close by – Charing Cross, Waterloo East and Blackfriars. Buses on the following routes stop outside the university: 1, 4, 26, 59, 68, 76, X68, 171, 172, 176, 188, 243, 341, 521 and RV1. Denmark Hill campus has a train station adjacent to it, which serves trains from Victoria, London Bridge, Blackfriars and Elephant and Castle. Several buses also stop close by, at King’s College Hospital: 40, 68, 176, 185, 468, 484; Camberwell Green (10 mins walk away): 12, 35, 36, 42, 45, 345, 171; Coldharbour Lane (5 mins walk away): 35, 45, 345. Guy’s Campus can be reach by foot from several underground stations including London Bridge (Northern and Jubilee lines), Borough (Northern line) and Monument (District and Circle lines). London Bridge also has a train station. A number of buses stop close to the campus: Tooley Street: 47; London Bridge Station: 21, 43, 48, 149, 343, 381, N381, 521; Borough High Street: 21, 35, 40, 47, 133. Waterloo campus is served by underground stations a short walk away, including: Waterloo (Bakerloo, Jubilee, Northern and Waterloo & City lines), and Charing Cross (Bakerloo and Northern lines). Charing Cross and Waterloo also have train stations. Two bus services stop outside the university: 381, RV1. Others stop close to the university: 1, 4, 26, 59, 68, 76, X68, 77, 139, 168, 171, 172, 188, 211, 243, 341, 507 and 521. Why not send your bags to KCL to save you the hassle of waiting at airport bag drops or luggage carousels and hauling your luggage around London. At Sendmybag we ship luggage around the world, allowing international students to send their bags to their university accommodation. We not only offer international student shipping but also shipping for domestic students across the UK. If sending your bags to student accommodation at KCL, it is important to be aware of your residence’s procedure for receiving deliveries. It is best to be in residence before your bags are due to arrive so that you can receive them in person. The London School of Economics and Political Science (LSE), founded in 1895, is a specialist university covering the social sciences. It has an excellent reputation and counts 16 Nobel Prize winners among its alumni/ staff, including George Bernard Shaw, one of LSE’s founders. The university has a large international community, with over 6700 international students (2013/14). Charing Cross (Jubilee, Northern and Bakerloo lines) 10 mins away. Buses also stop nearby: nos. 1, 4, 6, 9, 11, 13, 15, 23, 26, 59, 68, X68, 76, 77a, 91, 139, 168, 171, 172, 176, 188, 243, 341 and 521. Why not send your bags to LSE to save yourself plenty of hassle. At Sendmybag we ship luggage around the world, allowing international students to send their bags to their university accommodation. We not only offer international student shipping but also shipping for domestic students across the UK. If you are staying in student accommodation it is important to note the rules relating to the delivery of luggage. Larger deliveries are normally held at the reception of halls of residence. Luggage that arrives before your own arrival cannot be accepted, however. You must be in residence to collect the items promptly. The City University London was founded in 1894 as the Northampton Institute and become a university in 1966 when The City University was created. The University has over 7300 international students (2013/14) from over 75 countries. It is ranked in the top 5% of world universities according to the Times Higher Education World University Rankings of 2015. The University counts a number of former UK prime ministers among its alumni, including Margaret Thatcher and Tony Blair. The University has its main campus in the Islington area of London (Northampton Square), with further campuses in the City of London, and in the Holborn, Smithfield and Whitechapel areas of London. The main campus of the University is close to the Angel (Northern line) and Farringdon Tube stops (Metropolitan, Hammersmith & City and Circle lines). The Moorgate stop (Northern, Hammersmith & City, Circle and Metropolitan lines) is close to the Cass Business School and the Holborn (Central and Piccadilly lines) and Chancery Lane (Central line) stops are close to The City Law School and Gray’s Inn. Local buses also stop close to all university sites. Why not send your bags to the City University of London and save yourself the hassle of check-in, baggage carousels and dragging your luggage through London. At Sendmybag we ship luggage around the world, allowing international students to send their bags to their university accommodation. We not only offer international student shipping but also shipping for domestic students across the UK. University College London (UCL) is a world-renowned university situated at the heart of London, with its main campus in the Bloomsbury area. First founded in 1826 with the aim of making education accessible to the less privileged, it was the first university in England to admit female students on the same standing as men. Today, the University is rated top in the UK for research strength, and also has the best academic to student ratio in the UK. Of these academics, a high number have reached professor status. It is due to factors such as these that the University is consistently ranked among the top 20 universities in the world. Over 11,800 international students (2013/14) form part of the student body. Buses stop on Gower Street, right outside the main gates of the University. These are buses travelling from north to south. Those travelling in the opposite direction (south to north) stop outside Warren Street Station. Bus services to these stops include route numbers 10, 14, 24, 29, 73, 134 and 390. If travelling by train, several stations in London are only a short distance from UCL. These include Euston, King’s Cross and St Pancras. Why not send your bags to UCL and save yourself the hassle of check-in, baggage carousels and dragging your luggage through London. At Sendmybag we ship luggage around the world, allowing international students to send their bags to their university accommodation. We not only offer international student shipping but also shipping for domestic students across the UK. If you are staying at student residences, there are certain rules you should be aware of. The UCL Student Residences regulations state that luggage being shipped from abroad must be timed to arrive on or after the resident’s contract start date. Any items that arrive prior to this will be charged at a rate of £10 per week, or part thereof. All post must be addressed to the resident concerned and the address must be correctly labelled. This post will be sorted into pigeon holes and larger items kept in the office, with a note placed in the pigeon hole informing the resident of its arrival. We advise you check with your particular accommodation before sending your bags. Royal Holloway, University of London was opened in 1886, with Queen Victoria presiding. Today, the University has 8,619 students, with over 100 nationalities represented. The University is ranked highly in the world university listings. It achieved 118th place in the Times Higher Education World University Rankings in 2014-15 and was placed 17th in the UK. Royal Holloway is situated in Egham, Surrey in 135 acres of parkland. It is recognised as one of the most beautiful campuses in the world, given the beauty of the parkland, as well as the ornate architecture of the Founder’s Building. Egham can be reached from Central London by train. You can catch a train from London Waterloo to Egham, which takes 40 minutes. Egham is also connected to other locations by train, such as Reading and Woking. You can take a college bus from Egham Station to the campus, which takes around 10 minutes. This only runs during term time. Alternatively you can walk for twenty minutes to reach the campus. If you are flying to London, Heathrow is closest to the campus (only 7 miles away). You can then catch the no. 441 bus from Heathrow Central Bus Station to Royal Holloway. Or, take bus no. 71 from Terminal 5 (stop no. 9). 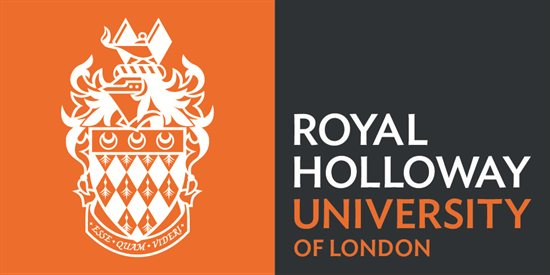 Why not send your bags to Royal Holloway to save you the hassle of waiting at airport bag drops or luggage carousels and hauling your luggage onto public transport. At SendMyBag we ship luggage around the world, allowing international students to send their bags to their university accommodation. We not only offer international student shipping but also shipping for domestic students across the UK. If sending your bags to student accommodation at Royal Holloway, it is important to be aware of your residence’s procedure for receiving deliveries. If you have larger items delivered to Royal Holloway student accommodation, you will receive a note in your pigeon hole. You should take this note to the post room, along with your student ID, to pick up the item(s). This is only possible at certain times – check with your accommodation for details. Certain residences require that you contact Customer Service Reception if you need to pick up an item. It is best to be in residence before your bags are due to arrive so that you can pick them up promptly. Queen Mary grew out of four colleges: Queen Mary College, Westfield College, St Bartholomew’s Hospital Medical College and the London Hospital Medical College. In 1989 Queen Mary merged with Westfield to form Queen Mary and Westfield College and in 1995 this institution merged with St Bartholomew’s and the London Hospital Medical College. In 2013 the name of the institution was officially changed to Queen Mary University of London. Today, the university has 20, 260 students, including students of 151 different nationalities. Queen Mary is spread across five campuses, all in the centre of London. There are numerous rail and bus networks serving the airports. Heathrow and London City airport are served by the London Underground (The Tube). The Piccadilly line serves Heathrow and the Docklands Light Railway serves London City). Stansted, Gatwick and Luton are served by fast rail services into London. Taking a coach is another convenient option from all airports, with the largest coach network run by National Express. For travel within London City Centre, there is a vast bus and underground network. In order to travel on this network, it is advised to obtain an Oyster card, which will provide cheaper travel than buying individual tickets. Oyster Cards can be topped up online or at ticket machines. These cards can then be swiped to open barriers into/ out of the underground or on buses. The Oyster card, therefore, facilities speedier and more convenient travel. Cards can be obtained either at a station or online at the Transport for London website http://www.tfl.gov.uk/ . Mile End – Queen Mary’s main campus is located on Mile End Road, close to the Mile End and Stepney Green Tube stops. The Whitechapel campus is located on Turner Street, close to Whitechapel Train Station and between Stepney Green and Aldgate East Tube stops. The Charterhouse Square campus is close to the Barbican Tube stop. The West Smithfield campus lies just south of the Charterhouse Square campus. The Lincoln’s Inn Fields campus is very close to Holborn Tube stop. Why not send your bags to Queen Mary and save yourself the hassle of waiting at airport bag drops or luggage carousels and hauling your luggage around London. At SendMyBag we ship luggage around the world, allowing international students to send their bags to their university accommodation. We not only offer international student shipping but also shipping for domestic students across the UK. If sending your bags to student accommodation at Queen Mary, it is important to be aware of your residence’s procedure for receiving deliveries. Staff at Queen Mary halls of residence will not sign for courier deliveries. You must therefore make sure that you are in residence to receive your bags yourself. Keep your phone to hand so that the driver can contact you if necessary and make sure SendMyBag has your correct phone number.